Today we went to the Pakuranga mall to do a survey. We asked only one question which was do you know what Matariki is? 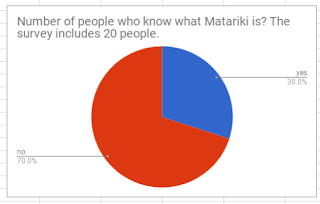 Out of 20 people 14 did not know what Matariki was and 6 knew about it we asked people from different cultures but all people lived in New Zealand. Some Maori people did not know about their new year too. It shows us that many people don’t know about Matariki even though they live in New Zealand. We should celebrate Matariki more by putting Matariki on the calendar, putting up posters, decorate malls and put it on the radio. We should also celebrate it in the city so that people know about an important festival of New Zealand. I really like how you survey.